You guys, it's been HOT here. It was so cool for so long AND THEN WHAM! I'm talking 105 degrees yesterday! AND WE LIVE 5 BLOCKS FROM THE OCEAN! Crazy right? So no ovens have been on. I barely have the desire to even switch on a burner. We want absolutely no heat, no flames, no warmth anywhere near our house! Away from us the need for cooking! So what is one to do? Smoothie it up, that's what. Lots and lots of smoothies. And good smoothies at that! Nutritious ones! So good, we forget it's hot outside (and trick the baby into thinking he's having a "popsicle" when we freeze said smoothies, or "ice cream"). When really they're nutrient-dense, power foods! Bwahahaha, take THAT, Luke! But honestly...go away heat. It's autumn. Bring on sweater weather (ie- unshaven legs and armpits for the next 6 months). Take THAT, Bill! 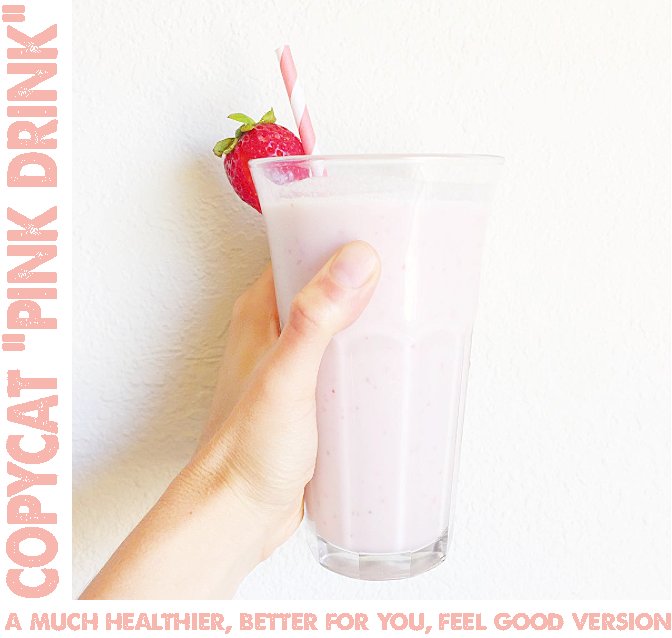 Here is a much healthier version of SB's "Pink Drink" (you know what I'm talking about, right? That coffee shop...that shall not be named...that also surprisingly makes smoothies...and has made an American-wide obsession with all things PSL and pumpkin spiced...you following me? ), which we had for lunch today! Serves two!!!! Put everything into your blender and blend until smooth! Hi! Christina, thank you for trying my recipes and sharing your thoughts with your followers! So glad you enjoyed them!